The next evening, after my grandmother had given me my bath, she took me once again into the living-room for another story. "Tonight," the old woman said, "I am going to tell you how to recognise a witch when you see one." "Can you always be sure?" I asked. "No," she said, "you can't. And that's the trouble. But you can make a pretty good guess." She was dropping cigar ash all over her lap, and I hoped she wasn't going to catch on fire before she'd told me how to recognise a witch. "In the first place," she said, "a REAL WITCH is certain always to be wearing gloves when you meet her." "Surely not always ," I said. "What about in the summer when it's hot?" "Even in the summer," my grandmother said. "She has to. Do you want to know why?" "Because she doesn't have finger-nails. Instead of fingernails, she has thin curvy claws, like a cat, and she wears the gloves to hide them. Mind you, lots of very respectable women wear gloves, especially in winter, so this doesn't help you very much." "Mamma used to wear gloves," I said. "Not in the house," my grandmother said. "Witches wear gloves even in the house. They only take them off when they go to bed." "How do you know all this, Grandmamma?" "Don't interrupt," she said. "Just take it all in. The second thing to remember is that a REAL WITCH is always bald." "Bald as a boiled egg," my grandmother said. I was shocked. There was something indecent about a bald woman. "Why are they bald, Grandmamma?" "Don't ask me why," she snapped. "But you can take it from me that not a single hair grows on a witch's head." "If she's bald, she'll be easy to spot," I said. "Not at all," my grandmother said. "A REAL WITCH always wears a wig to hide her baldness. She wears a first-class wig. And it is almost impossible to tell a really first-class wig from ordinary hair unless you give it a pull to see if it comes off." "Then that's what I'll have to do," I said. "Don't be foolish," my grandmother said. "You can't go round pulling at the hair of every lady you meet, even if she is wearing gloves. Just you try it and see what happens." "So that doesn't help much either," I said. "None of these things is any good on its own," my grandmother said. "It's only when you put them all together that they begin to make a little sense. "Mind you," my grandmother went on, "these wigs do cause a rather serious problem for witches." "What problem, Grandmamma?" "They make the scalp itch most terribly," she said. "You see, when an actress wears a wig, or if you or I were to wear a wig, we would be putting it on over our own hair, but a witch has to put it straight on to her naked scalp. And the underneath of a wig is always very rough and scratchy. It sets up a frightful itch on the bald skin. It causes nasty sores on the head. Wig-rash, the witches call it. And it doesn't half itch." "What other things must I look for to recognise a witch?" I asked. "Look for the nose-holes," my grandmother said. "Witches have slightly larger nose-holes than ordinary people. The rim of each nose-hole is pink and curvy, like the rim of a certain kind of sea-shell." "Why do they have such big nose-holes?" I asked. "For smelling with," my grandmother said. "A REAL WITCH has the most amazing powers of smell. She can actually smell out a child who is standing on the other side of the street on a pitch-black night." "She couldn't smell me," I said. "I've just had a bath." "Oh yes she could," my grandmother said. "The cleaner you happen to be, the more smelly you are to a witch." "That can't be true," I said. "An absolutely clean child gives off the most ghastly stench to a witch," my grand-mother said. "The dirtier you are, the less you smell." "But that doesn't make sense, Grandmamma." "Oh yes it does," my grandmother said. "It isn't the dirt that the witch is smelling. It is you . The smell that drives a witch mad actually comes right out of your own skin. It comes oozing out of your skin in waves, and these waves, stink-waves the witches call them, go floating through the air and hit the witch right smack in her nostrils. They send her reeling." "Now wait a minute, Grandmamma..."
"Don't interrupt," she said. "The point is this. When you haven't washed for a week and your skin is all covered over with dirt, then quite obviously the stink-waves cannot come oozing out nearly so strongly." "I shall never have a bath again," I said. "Just don't have one too often," my grand-mother said. "Once a month is quite enough for a sensible child." It was at moments like these that I loved my grandmother more than ever. "Grandmamma," I said, "if it's a dark night, how can a witch smell the difference between a child and a grown-up?" "Because grown-ups don't give out stink--waves," she said. "Only children do that." "But I don't really give out stink-waves, do I?" I said. "I'm not giving them out at this very moment, am I?" "Not to me you aren't," my grandmother said. "To me you are smelling like raspberries and cream. But to a witch you would be smelling absolutely disgusting." "What would I be smelling of?" I asked. "Dogs' droppings," my grandmother said. I reeled. I was stunned. "Dogs' droppings! "I cried. "I am not smelling of dogs' droppings! I don't believe it! I won't believe it!" "What's more," my grandmother said, speaking with a touch of relish, "to a witch you'd be smelling of fresh dogs' droppings." "That simply is not true!" I cried. "I know I am not smelling of dogs' droppings, stale or fresh!" "There's no point in arguing about it," my grandmother said. "It's a fact of life." I was outraged. I simply couldn't bring myself to believe what my grandmother was telling me. "So if you see a woman holding her nose as she passes you in the street," she went on, "that woman could easily be a witch." I decided to change the subject. "Tell me what else to look for in a witch," I said. "The eyes," my grandmother said. "Look care-fully at the eyes, because the eyes of a REAL WITCH are different from yours and mine. Look in the middle of each eye where there is normally a little black dot. If she is a witch, the black dot will keep changing colour, and you will see fire and you will see ice dancing right in the very centre of the coloured dot. It will send shivers running all over your skin." My grandmother leant back in her chair and sucked away contentedly at her foul black cigar. I squatted on the floor, staring up at her, fascinated. She was not smiling. She looked deadly serious. "Are there other things?" I asked her. "Of course there are other things," my grand-mother said. "You don't seem to understand that witches are not actually women at all. They look like women. They talk like women. And they are able to act like women. But in actual fact, they are totally different animals. They are demons in human shape. That is why they have claws and bald heads and queer noses and peculiar eyes, all of which they have to conceal as best they can from the rest of the world." "What else is different about them, Grand-mamma?" "The feet," she said. "Witches never have toes." "No toes!" I cried. "Then what do they have?" "They just have feet," my grandmother said. "The feet have square ends with no toes on them at all." "Does that make it difficult to walk?" I asked. "Not at all," my grandmother said. "But it does give them a problem with their shoes. All ladies like to wear small rather pointed shoes, but a witch, whose feet are very wide and square at the ends, has the most awful job squeezing her feet into those neat little pointed shoes." "Why doesn't she wear wide comfy shoes with square ends?" I asked. "She dare not," my grandmother said. "Just as she hides her baldness with a wig, she must also hide her ugly witch's feet by squeezing them into pretty shoes." "Isn't that terribly uncomfortable?" I said. "Extremely uncomfortable," my grandmother said. "But she has to put up with it." "If she's wearing ordinary shoes, it won't help me to recognise her, will it, Grandmamma?" "I'm afraid it won't," my grandmother said. "You might possibly see her limping very slightly, but only if you were watching closely." "Are those the only differences then, Grand-mamma?" "There's one more," my grandmother said. "Just one more." "Not blue! Their spit can't beblue !" "Blue as a bilberry," she said. "You don't mean it, Grandmamma! Nobody can have blue spit!" "Is it like ink?" I asked. "Exactly," she said. "They even use it to write with. They use those old-fashioned pens that have nibs and they simply lick the nib." "Can you notice the blue spit, Grandmamma? If a witch was talking to me, would I be able to notice it?" "Only if you looked carefully," my grandmother said. This is not a fairy-tale. This is about REAL WITCHES. Real witches don't ride around on broomsticks. They don't even wear black cloaks and hats. They are vile, cunning, detestable creatures who disguise themselves as nice, ordinary ladies. So how can you tell when you're face to face with one? Well, if you don't know yet you'd better find out quickly-because there's nothing a witch loathes quite as much as children. 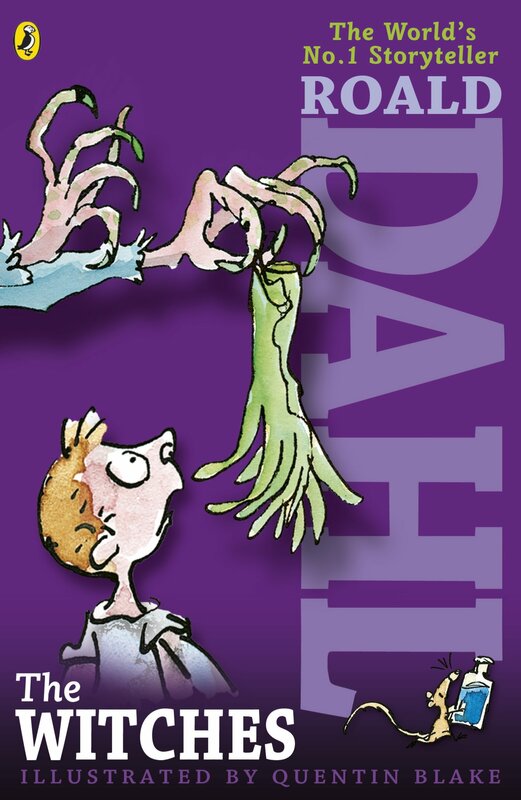 Bewitching, funny, and unquestionably engrossing, The Witches is perhaps the most beloved children's book written by the world's best storyteller, Roald Dahl.